Speaking of Japan's martial arts (see Tuesday's post), I recently came across a scientific study that reminded me about another martial art — the way of the sword. Researchers in England have found that a person reacting to another's action can actually be faster than the person to whom he or she is reacting. This reminded me of iaidō, which is known as the art of drawing a sword but more specifically is about drawing a sword in response to an opponent who has drawn first. Not an appealing situation to be in. The study also reminded me of a comment in "Kyushu, Where Japan's Green Tea Growers" (a documentary in which a Mellow Monk tea procurer is shown visiting two families of grower-artisans). 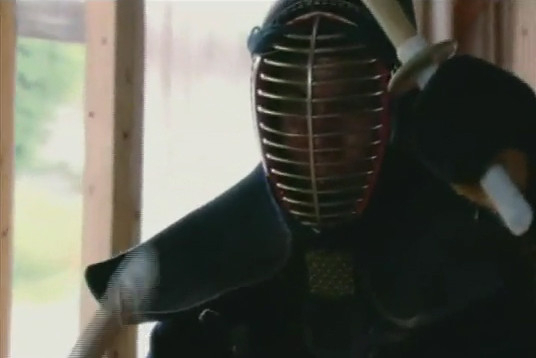 At a kendo school in Hitoyoshi, a kendo master discusses [video link] the importance of emptying one's mind before a bout — that doing so is necessary to assure quick action. But the reason for doing so is not merely to react to one's opponent but also to act as quickly and as unconsciously as one who is reacting. The concept of emptying one's mind also ties in with the philosophy of tea — as a prerequisite for mindfully focusing on the tea at hand and on one's guest. But then that is a topic for another post.